That was proof that I did open it. It turns out I didn't cut the PRV, which is pleasant news. The valve you see cut led to a pressure gauge, at least I no longer need to fear for my soaker. There is some tape around the balloons, it will most likely break off after one or two shots, but for now it's there as a stopgap to a leak. Any better solutions require all the balloons to come off, and that=torture. I have yet to fix the pump, but I'll try a test shot now to see if anything is different in performance. That pump looks bad. I like it better with the last balloon black. Looked like LRT. How hard is it to get the pump cap off? Yes, the pump broke last time I used it, I haven't fixed it yet. My plan was to keep the last balloon black, but it broke, now there are only 44 balloons. And that pump cap wasn't glued, so not hard at all. Hopefully the sphinx is the same way. Now I just need a sphinx. How do you remove te old PC? A saw, or is there an o-ring or something where you can just slide it out? Just an O-ring. WW soakers have a lot of screws, but are less challenging to open than Super Soakers because of the glue, or at least the Lightning/Blazer/Orca were. i have an AP gorgon i just added a QFD back to. 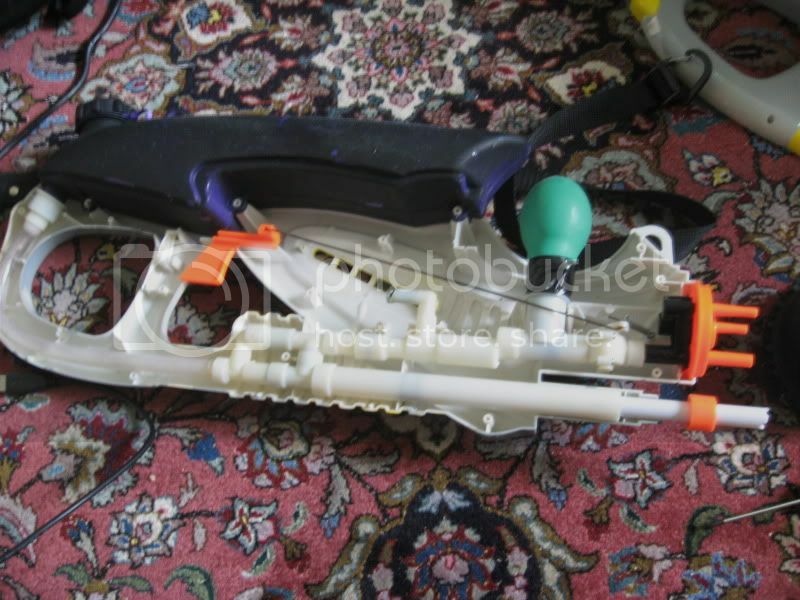 an i do this mod to my gun? If so what parts would i need? Read post 7. Decide if you want 1 or 2 PCs. 1 will be easier, but 2 will give you better shot time, and would be better with your backpack. If you decide 1, block off one pessure chamber, preferably the back one. Then follow the steps in step 7. Layering balloons can be a bit tricky, but eveyone develops their own method. If you decide on 2 PCs, make them both, slightly stronger than you want. Test fire without the PC covers. If one inflates slower, take a balloon of at a time until the PCs are even. Enjoy your new CPS. I think it would. It may restrict expansion some, but capacity will still be increased over the AP design. The problem is that the Gorgon has 2 pressure chambers, which means if you're going to replace both of them, that they need to have the same pressure to expand properly. That means equal number of balloons/LRT, same overall size, and same overall strength of balloons. Otherwise you'll get one expanding completely and the other doing nothing. As for placing the PCs back on, not really. The mod is to place the new CPS system inside the socket where the old pressure chambers go, so unless you hack them up, they won't fit. Alternatively, you could jam a few balloons inside the original pressure chambers, but that limits power (you won't fit more than 6 balloons in there, it's a pointless mod to try). Gee I dont wanna hack up the PC's ( I could need them in the future), but can i use a similar sized (or slightly larger) plastic ball? If you can find something that covers it well, then perfect. Make sure you drill a hole in the case so the PC can expand freely. For CPS, you want ventilation for the rubbr to expand freely. Yeah, for air. Otherwise the air would compress and add unwanted stress to the bladder PC. As for balloon stiffness, it depends on how many you layer. Anywhere between one and ten balloons, it'll be very wobbly. I'm at forty four balloons, I can barely squeeze them. Once you get past twenty, they get stiff.